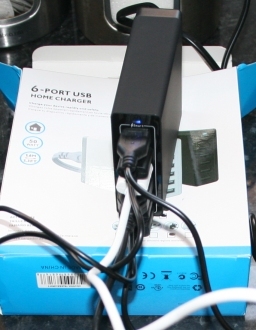 6 Port Mains Powered USB Charger to 2.4 Amps. 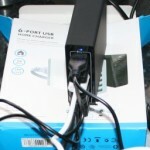 I’ve got a new 6 port mains usb charger to look at – it replaces my old 4 port charger and has a few added benefits aswell. Here’s a short review of the new charger by Sminiker I bought online. Firstly, my old mains powered USB charger had only four ports. In itself, this wasn’t a bad thing, there are only so many devices which need charging at one time in most cases, but in reality the old charger had a hidden downside. Whilst there were 4 ports on it, 2 of them were allocated to charging devices up to 2.0 amps, and the other 2 had an output rating of only 1.4 amps. So effectively, due to most of my devices needing more than 1.4 amps to charge, I was left with only 2 ports remaining. 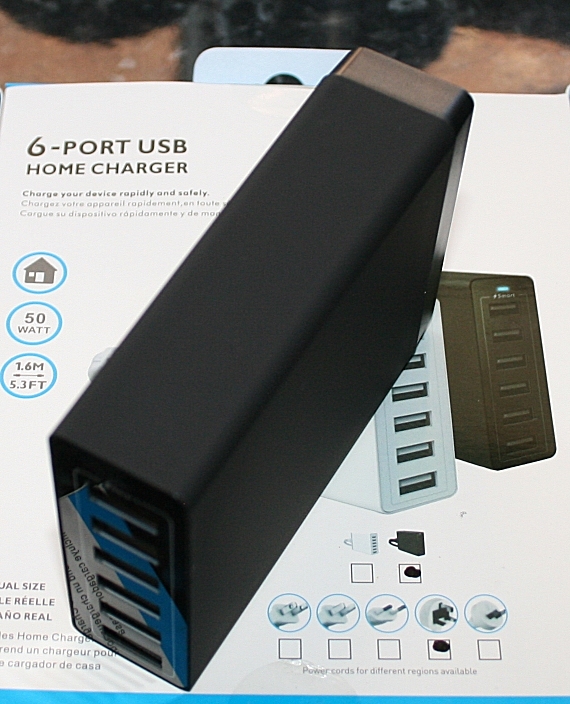 Enter my new 6 port usb charger which is supplied with mains power. This one has all 6 ports available for charging up to 2.4 amps at the same time. So there are now no more worries about not having enough ports ready to re-charge my batteries. Lets take a look. It is available in black or white and here it is sitting on its outer packing box. It comes with a long 1.6m power lead for attaching it to the mains socket in your house. You will notice that the ports are neatly aligned down the front of the box and have good spacing between them to accomodate those slightler thicker USB socket end connectors (which are thankfully quite rare these days). According to the sales page it has a built in smart IC which prevents your device from overcharging, overloading the battery or over heating and short circuiting. I would point out though, that whilst I was using this heavily with a number of devices simultaneously connected, it did get rather warm – this may or may not be a “feature” of these larger capacity 50W – 10AMP total type of multiple port charging units. On the rear of the box are the figures stating input and output – I am fairly picky when it comes to manufacturers of these sorts of gadgets, so when reviewing them I tend to focus in on such details. Below is an image taken from the rear of the charge box which clearly displays the requirements for input power and output limitiations. You may also note in the above, the mains power lead is removeable – you can see its input socket above. 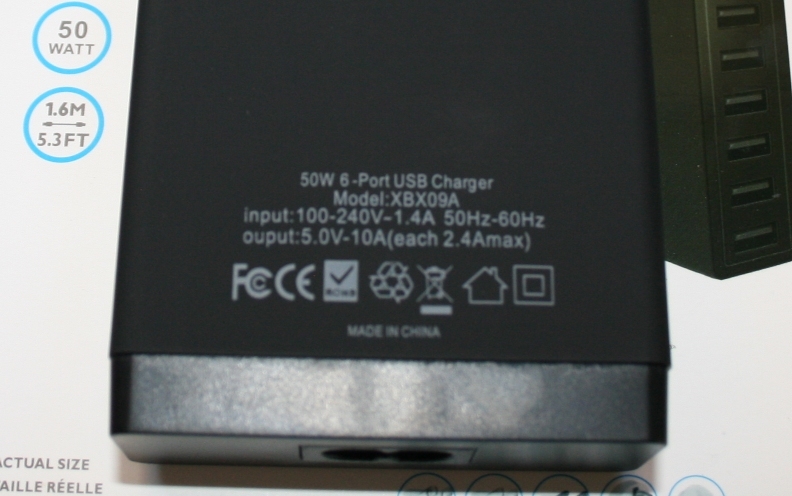 So, lets take a look at the 6 ports in full charging action with the following devices all connected at the same time. a) Two CoolReall 15k MAH Lithium Ion Power Packs. b) One Pink smaller 5k MAH Powerpack. c) One Samsung Galaxy S2 Mobile Phone. d) One Set of Bluetooth Headphones. e) A Google Nexus 7 Android Tablet. 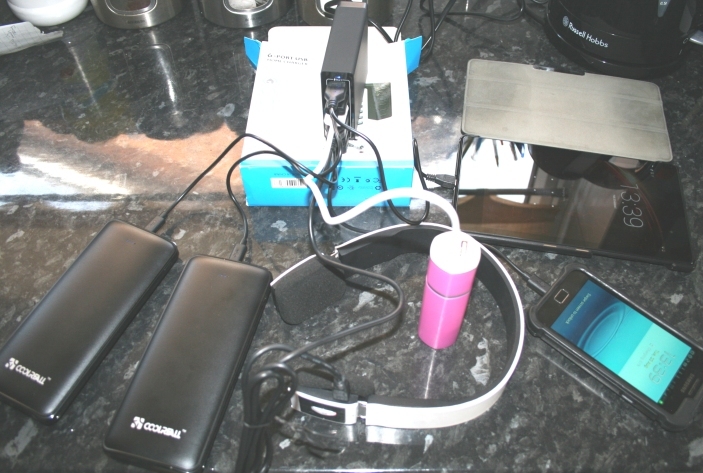 So six devices all attached and all charging away on their own USB port quite happily. The small blue light at the top of the charger indicates that it has power – perhaps on these things an individual LED (one for each port) which displayed charge status over time would be nice – but then again this would add extra cost. It seems a little ironic (if that’s the right word) that I am using a charger to charge batteries which in-turn will be used to charge more batteries inside the different things – like the headphones, but at the end of the day if you are out and about in the car, or camping for example, then you won’t always have access to a mains power supply but will still want to recharge your items. So thinking ahead a powerbank is ideal. Overall I am pleased with my multi-port usb charger in every respect. Much better than the inferior 4 slot one I had in the past. Garden Lantern Lights, Ball Shaped in Different Colours and Solar Powered.